Light brown body. Size: 135x130x65mm, weight 1.3 kg. In 1937 Mr. Robert Mascré (1903-1985) decided to manufacture movie cameras and in 1946, he created Ercsam Company, located in Paris. In 1950, he offers 8mm versions of the 9.5 range. 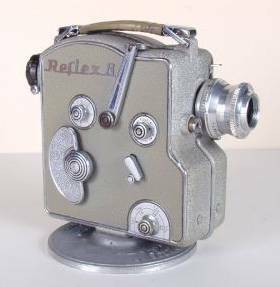 In 1962, Pathé-Cinéric became Ercsam�s partner and in 1965 all Auto Camex are named Pathé Royal or Imperial, according to the optical equipment. All Ercsam movie cameras have mecanical motors with specific mount lens and with no turret.